Israeli Prime Minister Benjamin Netanyahu is on a six-day visit to India. Israeli PM Benjamin Netanyahu will hold comprehensive talks with PM Narendra Modi. 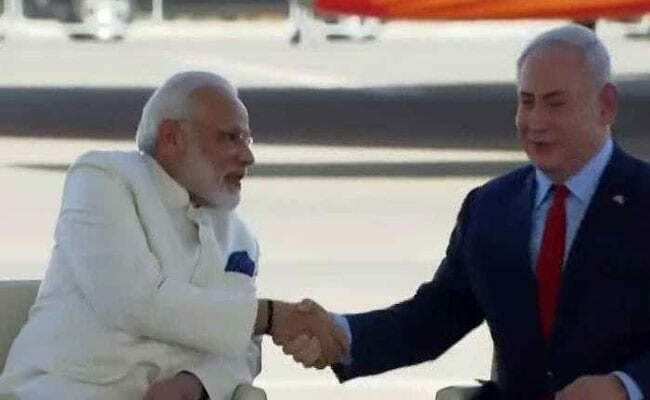 New Delhi: Prime Minister Narendra Modi went to the Delhi airport today received Benjamin Netanyahu, the first Israeli Prime Minister to visit India in more than a decade. Accompanied by a 130-member business delegation, Mr Netanyahu is in India on a six-day visit, during which the two nations hope to deepen ties in trade and defence. 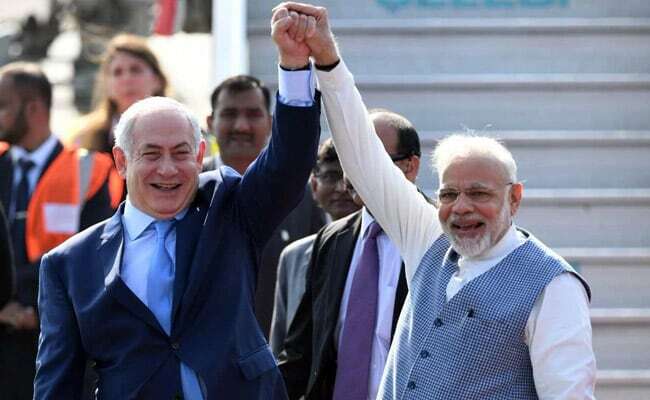 The Israeli PM will hold comprehensive talks with PM Modi and also visit his home state Gujarat, where the two leaders will hold a joint road show on Wednesday. The Israeli PM will also visit Ahmedabad, Mumbai and Agra. On January 15, he will meet with the Indo-Israeli CEO forum in New Delhi and address a separate business event. 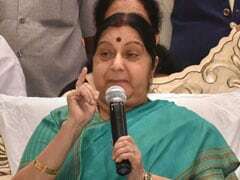 He will deliver a speech at the Raisina Dialogue on January 16. Mr Netanyahu will also meet President Ram Nath Kovind. PM Narendra Modi had visited the Jewish state in July last year, becoming the first Indian premier to do so. PM Modi is hosting a private dinner for Mr Netanyahu tonight. The dinner is organised only for the family members. 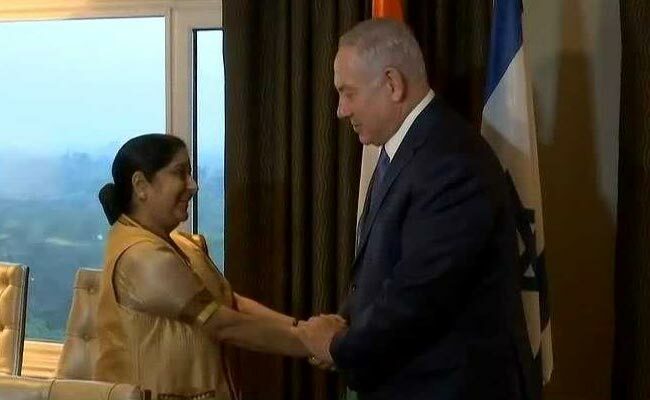 Israel Prime Minister Benjamin Netanyahu met External Affairs Minister Sushma Swaraj in Delhi. Mr Netanyahu arrived in India today on a six-day visit. Israeli PM Benjamin Netanyahu signs visitor's book at Teen Murti Chowk. 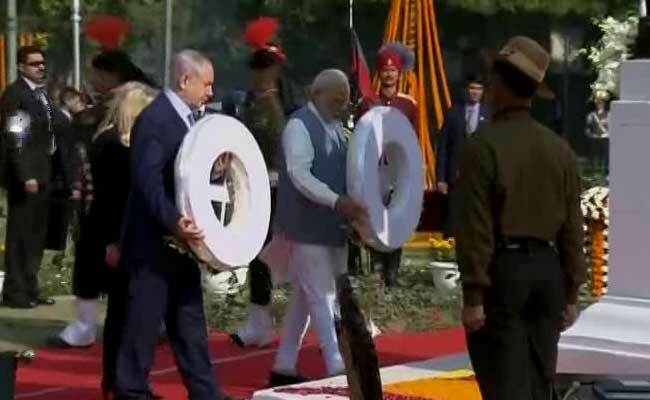 PM Modi and Benjamin Netanyahu lay wreath at the Teen Murti Chowk. 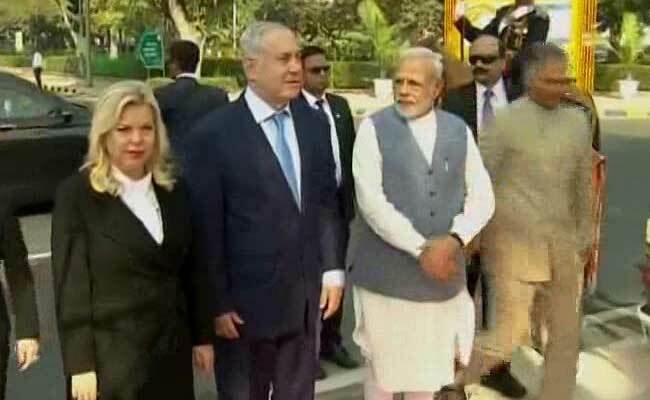 PM Modi and Benjamin Netanyahu arrive at the Teen Murti Chow, ahead of a ceremony for formally renaming it as Teen Murti Haifa Chowk. 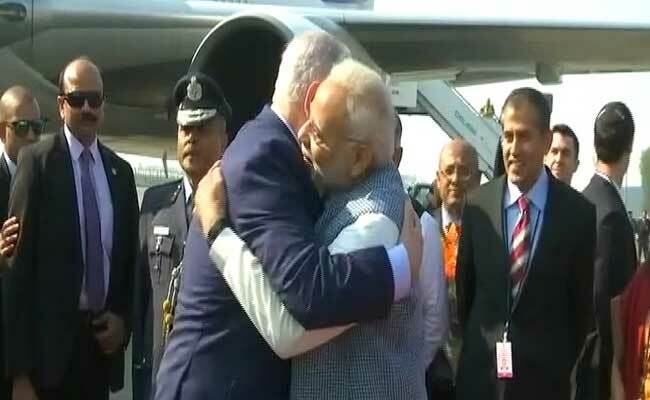 PM Modi welcomes Israeli counterpart Benjamin Netanyahu at Delhi airport. This evening I am leaving on an historic visit to India. I will meet with the PM, my friend @narendramodi, with the Indian President and with many other leaders. Israeli PM Benjamin Netanyahu arrives in Delhi. 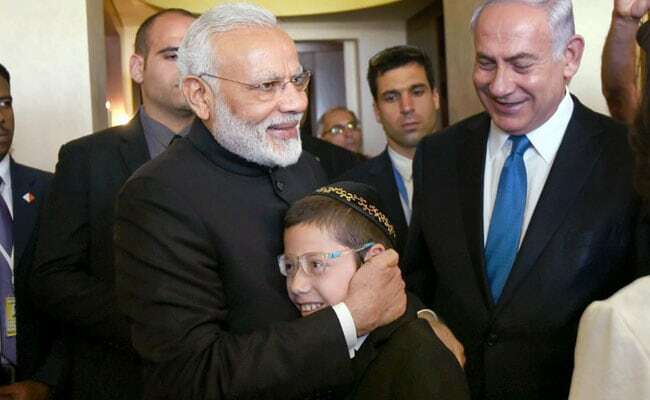 The visit by Israeli PM Benjamin Netanyahu marks 25 years since the establishment of diplomatic relations between the two countries and takes place about six months after PM Modi's trip to Israel, the first by an Indian prime minister to the Jewish state. Benjamin Netanyahu's visit to India is only the second one by an Israeli prime minister and comes after a gap of 15 years. Former prime minister Ariel Sharon visited India in 2003. Israel PM Benjamin Netanyahu to arrive in India soon. 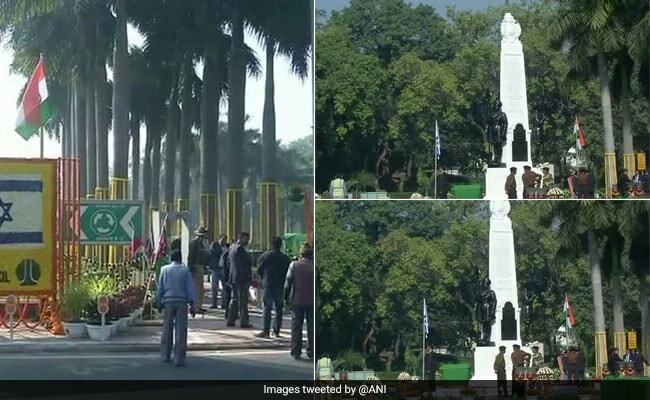 Visuals from Delhi's Teen Murti where PM Modi and PM Netanyahu will attend ceremony to mark the formal renaming of Teen Murti Chowk as the Teen Murti Haifa Chowk. The Teen Murti Memorial will be formally renamed as Teen Murti Haifa Chowk today. Israeli Prime Minister Benjamin Netanyahu will be present at the ceremony along with PM Modi. visitor's book at the memorial. The brigade carried out the victorious assault on the fortified city of Haifa on September 23, 1918, during World War I. The terrorists had carried out the attacks over three days and killed 166 people. Moshe is expected to arrive on Tuesday, ahead of PM Netanyahu's arrival in Mumbai on Thursday. Israel Prime Minister Benjamin Netanyahu will arrive in India this afternoon on a six-day visit hoping to deepen ties in trade and defence. Israeli PM is on a six-day visit where he will visit Delhi, Ahmedabad, Mumbai and Agra. On January 15, he will meet with the Indo-Israeli CEO forum in New Delhi and address a separate business event. He will deliver a speech at the Raisina Dialogue on January 16. On January 18, he will have a number of engagements in Mumbai.